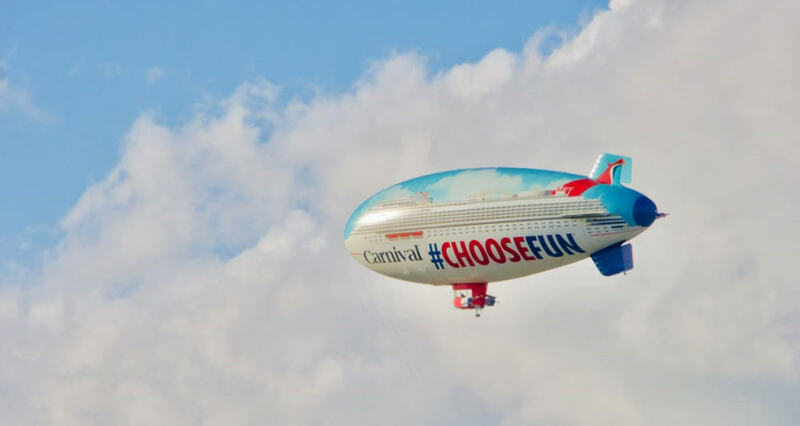 Carnival Cruise Line is extending the journey of the AirShip which has completed a successful month touring California in anticipation of the new Carnival Panorama. The popular Carnival AirShip will keep on going and extend its journey beyond California to Nevada and Arizona. The airship is completed a month-long tour of California in anticipation of the new Carnival Panorama which will begin cruising from the region towards the end of 2019. Starting from February 2 the #ChooseFun Airship will begin a 5-day tour of Las Vegas. The blimp will be above in the slues at popular event and attractions including the Las Vegas Strip. On February 13 the airship will arrive in Phoenix which will also last for five days. The cruise line will continue the sweepstakes as part of the #ChooseFun promotion. It includes a chance to win a free cruise along with other prizes on offer too. It gets even better from Carnival because if anyone takes a photo of the airship and posts it on social media using the hashtag the cruise line will donate $2 to its longtime charity partner St. Jude Children’s Research Hospital. The Carnival Cruise Line airship is helping promote operations on the west coast and it has been busy visiting major attractions and ship home ports in California for the past month. The airship also visited the New Years Day Rose Parade which included Carnival’s first ever entrance with the Carnival Panorama float. Carnival Panorama will be based out of Long Beach, California and begin cruises in December 2019. She will be the first new Carnival cruise ship to based in the region in 20 years! The ship will sail year-round itineraries to the Mexican Riviera joining Carnival Imagination and Carnival Inspiration to carry up to 600,000 guests annually. Carnival Panorama will be the third Vista-class vessel with a gross tonnage of 133,500 and a guest capacity of 3,900.